Last year, China Miéville released Three Moments of an Explosion (reviewed here), a book of short stories that once again confirmed him as one of the pre-eminent voices in world fantasy. While readers are waiting for the next full length Miéville novel, expected around August this year, he has released a story described as a “novella”. 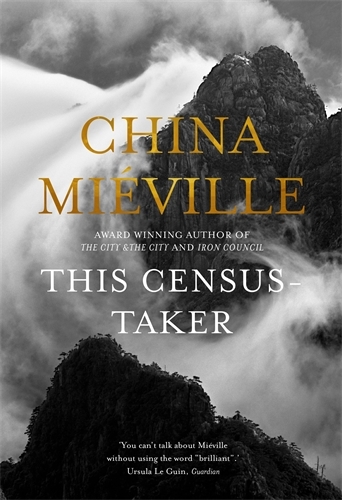 At just over 200 pages long, This Census-Taker was probably a little too long for the recent anthology, but possibly not long enough to be called a novel. This Census-Taker opens with typical Miévillian flourish: a young boy is running down a hill – away from what? towards what? is that blood on his hands or dirt? how old is he (even he isn’t sure)? The first paragraph is part third person, part first person, the facts are in question – but it is immediately engaging. The story only becomes both stranger and more obscure from there. The boy lives on a mountainside above an unnamed town that exists on two sides of a bridge in the mountains. There has been a war of some sort, there is a distant city on the coast but few go there and fewer return. The boy’s father, though often violent, is respected for his ability to make keys with potentially otherworldly powers. His mother has disappeared and the townsfolk, although suspicious of the boy’s father, force him to stay with his remaining parent. The boy makes friends in town, two teenagers who try to look out for him, but has to find his own way. Things change when the Census Taker comes. But who is he counting and why? It is probably not accurate to describe This Census-Taker as fantasy or science fiction although it has some elements of both. There are the mysterious keys that the boy’s father makes, the hint of that war that might have involved human-like automata. But without enough detail, this sits squarely on the allegorical new weird spectrum. Perhaps, despite its length, this remains a novella due to its unwillingness to explore this surrounding world. As such this is not going to be a book for everyone. Miéville fans, used to his inventive use of language, his narrative flourishes and his exploration of themes of alienation, identity and belonging, will enjoy this short excursion into yet another new, if sketchily described, world. Others, however, may just be feel alienated.